Philadelphia police outside Martin Luther King High School in East Germantown. A suspect is in custody after Martin Luther King High School in East Germantown was placed on lockdown Wednesday morning. Officer Christine O'Brien, of the Philadelphia police, said the school on the 6100 block of Stenton Ave. was put on lockdown around 9 a.m. after there were reports that a student had a gun on school property. "We were initially told that there was a threat at the school," said O'Brien. A juvenile was taken into custody shortly after 9 a.m. at the Fern Rock Transportation Center as part of the investigation, O'Brien said, noting that the individual has not been charged yet with any crime. Police spokesman Carl Holmes Jr. said police are still actively searching for a gun rumored to be stolen and then passed among several teens. O'Brien said a gun had not been recovered at the time of the suspect's apprehension. Philadelphia police representatives also said that there were no threats made at MLK High and the lockdown was called as part of an investigation into a stolen gun. The lockdown was lifted shortly after 9:30 a.m. The incident is the latest in a week of police responding to threats. 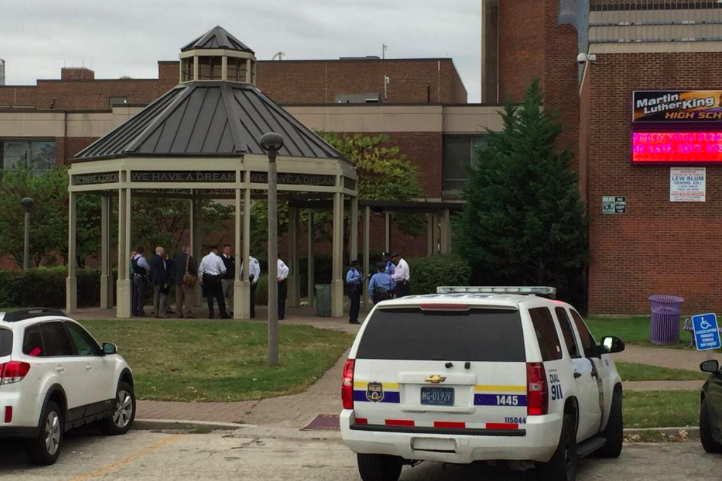 The Community College of Philadelphia was locked down Tuesday after a report of a person with a gun on campus. The day before, an online threat of violence against local universities in the Philadelphia area had students and residents on alert.